Moving on with Fighting Insider's Kettlebell section, this week's featured exercise is the Kettlebell Clean. 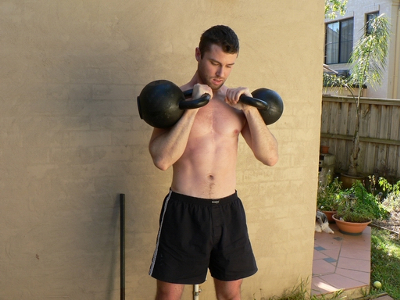 Following last week’s Kettlebell Swing is the Kettlebell Clean. The Kettlebell Clean is one of the basic Kettlebell exercises that one needs to master. Its main goal is to provide safe methods of bringing single or double Kettlebells in an overhead position via lifts. It is also a precursor for military press, push press, double jerk and many more. Contradicting other beliefs, it is not used as a forearm-toughening exercise. Instead, the Kettlebell Clean is designed for strength and endurance exercises, or in combination of body weight and high-repetition Kettlebell exercises. When Kettlebell Clean is properly executed, it should land lightly and must not cause bruises or pain to either forearm or shoulder. Otherwise, you are doing it wrong! If that’s the case, assess the situation and make the necessary corrections. To learn how to execute a proper Kettlebell Clean, check out Steve Cotter’s video tutorial below.